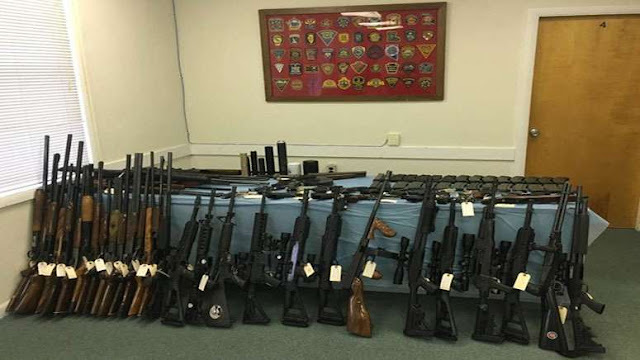 62-year-old Jeffrey Dusti faced a judge during a dangerousness hearing following his arraignment last week on weapons charges in connection with a Massachusetts State Police bust that yielded 47 illegal firearms, 44 homemade silencers and 35,000 rounds of ammunition. Dusti was also said to be in possession of a loaded revolver equipped with laser sighting and a sawed-off shotgun at the time of his arrest. A police report said Dusti had ties to the Hell’s Angels. Dusti was ordered held without bail following a three-hour hearing. Police were executing an arrest warrant for charges of assault and battery with a dangerous weapon on a person over 60, intimidation of a witness, threatening to commit a crime, and two counts of making annoying phone calls.